Sound-Proof, a Swiss start-up created at ETH’s Institute of Information Security, developed a seamless two-factor authentication mechanism that compares the ambient noise recorded by a user’s smartphone to the ambient noise recorded by the computer being used to log in. While the technology and security are top-notch, Sound-Proof needed an identity and a new web page that demonstrated this. After these were complete, Sound-Proof came back to us for an engaging explainer video they could use to attract new corporate clients. The new identity and website for Sound-Proof needed to resonate with two groups of users with different expectations and levels of knowledge: those on the technology side, who would integrate Sound-Proof into their websites, and the end-users, who would then use Sound-Proof on these websites. Thus, the visual language of the identity had to demonstrate that using Sound-Proof is not simply hassle-free, but incredibly secure. Similarly, the informational needs of both groups of users needed to be balanced on the website and in the promotional video. In designing Sound-Proof’s new logo, we found the best image to represent Sound-Proof comes from how Sound-Proof actually works. The logo we created is a representation of the two sound waves that are compared to each other when a user tries to sign in using the technology. These waves then come together and take the shape of a slightly abstracted key, a common symbol for security. 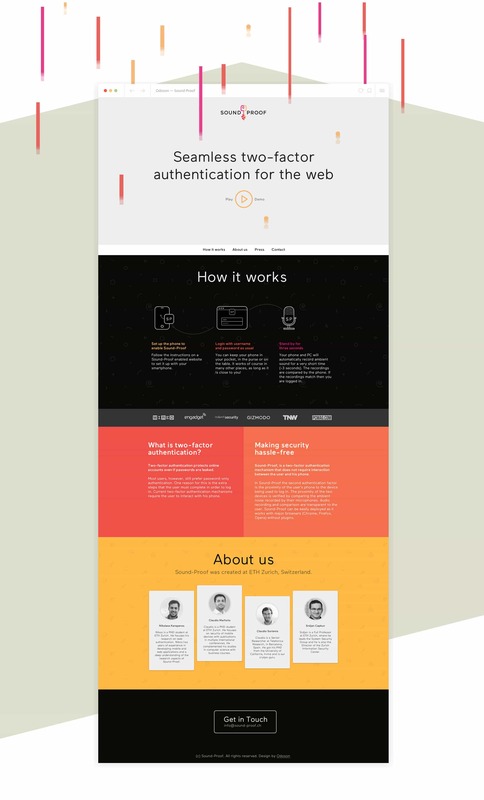 The website is an extension of this visual language and gently introduces the user to Sound-Proof and two-factor authentication as they scroll down, without overwhelming with technological jargon. Developers and other technical users can quickly find their way to the specs and details they need and get in touch regarding implementation. For the video, we dispensed with the clichés often found in start-up videos and concentrated on developing a clean, smooth, and minimal style and story. The result is a crisp, compelling 2D animation that mirrors the straightforward process of Sound-Proof. The finished logo at the very top is the result of an extensive process of research, (roughly) sketching out new ideas, refining them and doing it all over again. The logo we finally created is a representation of the two sound waves that are compared to each other when a user tries to sign in using Sound-Proof. These waves then come together and take the shape of a slightly abstracted key, a common symbol for security. The website is an extension of this visual language and gently introduces the user to Sound-Proof and two-factor authentication as they scroll down, without overwhelming with technological jargon. We developed a crisp, compelling 2D animation that mirrors the straightforward process of Sound-Proof. Both style and story have been reduced and are presented in a clean and minimal way.